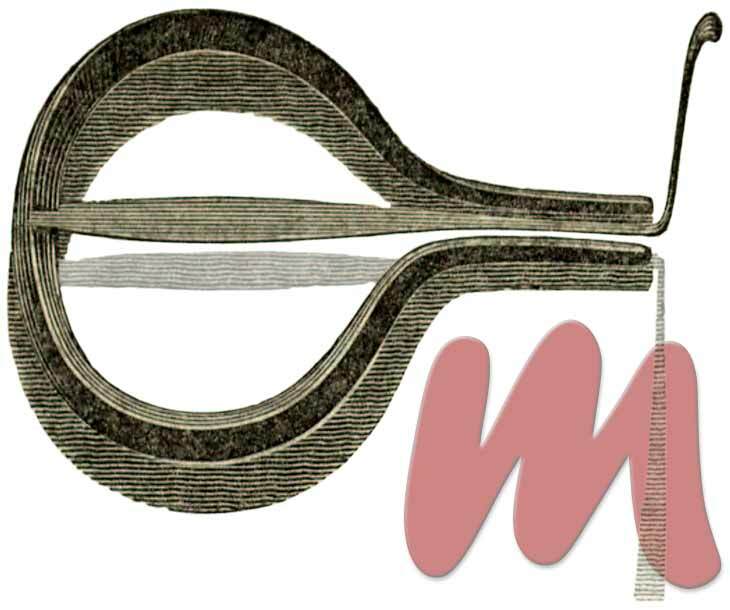 JEW'S HARP, possibly a corruption of Jaw's harp. In French it is called Guimbarde, and in German Maul-trommel [sic], Mund-harmonika, or Brummeisen (i.e. buzzing-iron). In the Highlands, where it is much used, it is called Tromp. This simple instrument consists of an elastic steel tongue, rivetted at one end to a frame of brass or iron, similar in form to certain pocket corkscrews [Korkenzieher], of which the screw turns up on a hinge. The free end of the tongue is bent outwards, at a right angle, so as to allow the finger to strike it when the instrument is placed to the mouth, and firmly supported by the pressure of the frame against the teeth. A column of air may vibrate by reciprocation with a body whose vibrations are isochronous with its own, or when the number of its vibrations are any multiple of those of the original sounding body. On this law depends the explanation of the production of sounds by the jew's harp. The vibration of the tongue itself corresponds with a very low sound; but the cavity of the mouth is capable of various alterations; and when the number of vibrations of the contained volume of air is any multiple of the original vibrations of the tongue, a sound is produced corresponding to the modification of the oral cavity. Thus, if the primitive sound of the tongue is C, the series of reciprocated sounds would be C, E, G, B♭, C, D, E, F, G, etc., and by using two or more instruments in different keys, a complete scale may by obtained, and extremely original and beautiful effects produced. Maultrommel (Jew's Harp), wie sie Wheatstone 1828 für akustische Versuche benutzt hat. Abb. aus The Quarterly Journal of Science 1828. The elucidation of this subject is due to the ingenious researches of Professor Wheatstone, which may be found in the 'Quarterly Journal of Science, Literature, and Art,' for the year 1828, 1st part, of which the above is a condensed account. A soldier of Frederick the Great of Prussia, so charmed the king by his performance on two jew's harps that he gave him his discharge, together with a present of money, and he subsequently amassed a fortune by playing at concerts. 1 Charles Wheatstone: On the Resonances, or Reciprocated Vibrations of Columns of Air, in: The Quarterly Journal of Science, Literature, and Art, January to June, London 1828, S. 175-182.